The League Cup will be known as the Capital One Cup from next season after the Football League agreed a new four-year sponsorship deal. The competition had been sponsored by brewers Molson Coors since 1998, and branded as the Carling Cup since 2003. Football League chief commercial officer Richard Heaselgrave said: "This is terrific news for clubs and a great way to conclude the season." The first draw for the Capital One Cup will be held on Thursday, 14 June. The first-round ties will be held in the week beginning 13 August and will start the domestic season this year, with the league programme following over the weekend of 18 August. All Championship clubs - bar Blackburn and Bolton - will be in the first-round draw alongside clubs from League One and League Two. Thirteen Premier League clubs join Blackburn and Bolton in round two, to be played at the end of August, while seven top-flight sides involved in European football join the competition in round three. 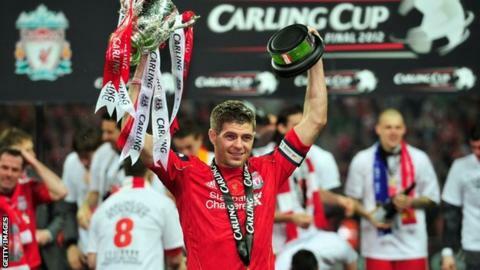 The 2011-12 Carling Cup was won by Kenny Dalglish's Liverpool. Heaselgrave added: "The Capital One Cup is in great shape having been re-invigorated in recent seasons by a number of memorable finals, some thrilling midweek cup football and a first glimpse of the stars of the future." The first final of the Capital One Cup will take place at Wembley on Sunday, 24 February 2013.